I started last week to write about groups across North America praying the Office of Compline on a regular basis outside of monasteries, and this week I’m writing about the Compline Choir at St. David’s Episcopal Church in Austin, Texas. It was founded in 1985, the third group chronologically after the choirs in Seattle (1956) and Honolulu (1976 – the subject of last week’s blog). But St. David’s was the first group whose founder had been a member of the Compline Choir in Seattle. Leslie Martin left his post in Seattle in 1985 to become organist/choirmaster at St. David’s, Austin. His love of the Compline service inspired him to start a group of men’s voices (similar to that in Seattle) singing a weekly office of Compline, but, unlike Seattle, the service was based on the order in the 1979 Episcopal Book of Common Prayer, with a few modifications. When Les left Austin in 1989 for a position in New Britain, CT, the choir continued under the direction of David Stevens, who is still Director of Music at St. David’s today. Les started a Compline group in Connecticut, but that group ceased after he returned back to Seattle in 1992, where he sang again with the Compline Choir at St. Marks until 2005.
blessed was the parent’s eye that watched thy slumbering infancy. and blessed they, for ever blest, who love thee most and serve thee best. David Stevens described to me a phenomenon that we have long experienced in Seattle – that many persons’ first encounter with a particular parish is through attending Compline there. It is the nature of this meditative service, where all that is expected is a kind of attentive listening, that creates a welcoming “sacred space” for attendees. For more than 25 years now this has been offered at St. David’s in Austin, and the Underground congratulates you! Last Sunday was quite a treat for me, as I was resting at home after surgery, and was able to see the weekly videocast of the Byrd Ensemble’s Compline service (7:30 PST) and then catch the service from St. Mark’s Cathedral live on www.king.org. The Compline Choir celebrated the Baptism of Christ by singing the anthem of the same name by Peter Hallock, with the countertenor solos taken by our newest member of the choir, Tyler Morse. Here’s a link to the podcast (the piece begins at about 21:13) – also read last year’s blog about this wonderful composition. Peter Hallock (b. 1924) has also released his latest CD of several of his large-scale compositions, The Last Judgment and Te Deum Laudamus, recorded by the Tudor Choir, and only available right now at Ionian Arts. I’ll be blogging about this CD in the future! Today I am beginning a new feature of the Compline Underground: each week I will tell the story of one of the fifty-plus groups across North America that is praying the Office of Compline (Night Prayer). But I will continue to write as well about all things pertaining to the office, especially what’s happening with our group at St. Mark’s, Seattle. The group that immediately came to mind for my first story is the Compline Choir of the Lutheran Church of Honolulu. To my knowledge, it is the first group whose founding was inspired by the Compline service in Seattle. While a student at the University of Washington in Seattle in the early 1960s, Carl Crosier attended not only the Compline at St. Mark’s Cathedral, but also the wonderful organ concerts, the Good Friday and Advent Processionals, and the “historically informed” performances of Handel’s Messiah — all creations of Peter Hallock, organist/choirmaster at St. Marks from 1951-1991, and founder/director of the Compline Choir from 1956-2009. After moving to Hawaii, Carl became involved in the music program at the Lutheran Church of Honolulu in 1972, where plans were already underway to renovate the building and install a tracker-action organ, which was dedicated in 1975. 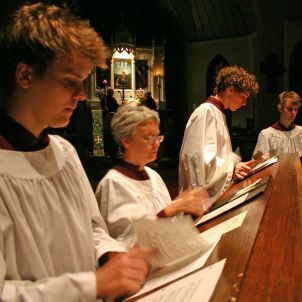 The Compline Choir was started on August 1, 1976, with eight men from various churches – so it was built on the model of the Seattle Compline Choir, which in turn had its origin in the English ATB (alto – tenor – bass) choir. Most people know about the English “men and boys” choir tradition, but do not know that there is a substantial repertoire for the group when boys are not needed or on holiday. Peter Hallock, who sang in the choir at Canterbury Cathedral (a privilege rarely given to an American) while a student there in 1949-51 also influenced Carl Crosier to take up the countertenor (male alto) voice. Peter helped Carl with many things liturgical and musical in the formation of this first Compline Choir offshoot, and came to Honolulu to give workshops. Carl began making fair copies of Peter’s music and helped get a number of pieces published. From the early days of music publishing software to the present, Carl has continued to publish music with Peter, forming a company, Ionian Arts, in 1985. I first remember Carl from the summer of 1979, when the Seattle Compline Choir made a trip to Honolulu to sing at a regional convention of the American Guild of Organists. Peter wrote his anthem “Come, Holy Spirit” for the occasion, and we sang it at a candlelit Compline service at the Episcopal Cathedral. We also sang Compline with Carl’s choir at the Kawaiahao Church. Over the years, Carl has sung with the Seattle choir, including our travels to Russia and Scandinavia (1997) and England (2000). Carl retired both as Cantor (Director of Music) as well as director of the Compline Choir in August, 2011 – exactly 35 years after it began. The choir is now led by Keane Ishii; they still are singing every Sunday evening at 9 p.m.
Carl’s wife Katherine remains as organist at LCH, and she is a prolific blogger – I’ve put a link to all of her blogs with the “Compline” tag here. Take a look at the church’s website page for Compline; there is a brochure (PDF) about the service that can be downloaded. I’ve put a permanent link to Katherine’s blog, “Another Year of Insanity”, on my links on the upper right of this page. Last week in Seattle we sang Peter Hallock’s lovely setting of the Christmas carol “Lullay, my liking“, and one of our newest singers in the choir, Tyler Morse, sang the solo in verse 2. This 21-year-old countertenor, a senior at Pacific Lutheran University, continues the great male alto tradition begun by Peter Hallock and continued by Carl Crosier and many others! I’ll post a podcast of the service from January 1 when it becomes available. At the beginning of Compline we sang a lovely New Year’s carol (to the tune “Greensleeves”) based on a poem from 1642, and here is the first verse — may you have a wonderful new year! Then let us now our sins down tread, and joyfully all appear. Let’s merry be this day and let us both now sport and play. Hang grief, cast care away, God send us a Happy New Year.